Hat tip to a great post by "E7 Now & Then" on "The Plaistow Land Grabbers" who are an largely forgotten but important part of the radical history of West Ham. A second post is to follow. 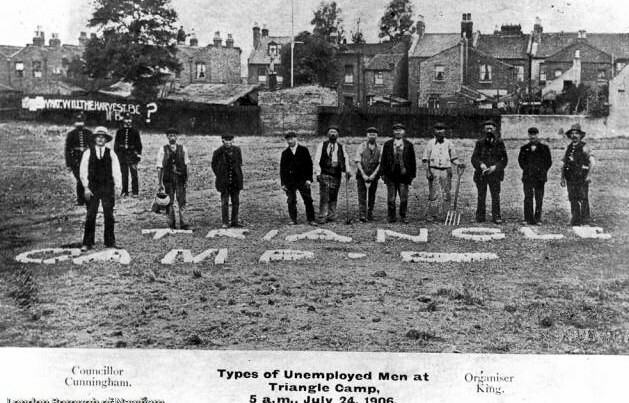 In a protest against unemployment, local plumber and local Marxist Social Democratic Federation (SDF) councillor (wearing white hat on left), "Ben Cunningham, and 14 unemployed workers to march on a piece of council-owned, vacant land of approximately three acres, just south of the railway line between Upton Park and Plaistow, on 13 July 1906 - and occupy it". Check out what happened and more about our local radical history of direct action (pros and cons) here and I look forward to the second installment.